Scentennials Hummingbird Harmony Scented Drawer Liners are inspired by the Hummingbirds actual choice of flowers. With top notes of citrus, mid notes of wild greens, cedar leaf, spiced wood and base notes of amber and musk, Scentennials Hummingbird Harmony Scented Drawer Liners will keep clothes, delicates and linens smelling pleasant and fresh while simultaneously acting as a dainty dose of décor. 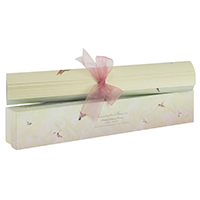 All sheets are tied with a soft colored ribbon and comes in a matching presentation box.